IODP Expedition 342 is over and I’m back on land. The expedition was a huge success in terms of meeting the scientific objectives. The main goal was to recover expanded sedimentary records of oceanographic/climatic conditions and events during the Paleogene (~65-23 million years ago). This time in Earth history contains several global warming events, or ‘hyperthermals,’ and the transition from an ice-free (or nearly so) world to a world with ice sheets at the poles. In addition to plenty of Paleogene sections, we ended up with some fantastic records of Earth history before (Cretaceous) and after (Miocene) the Paleogene. 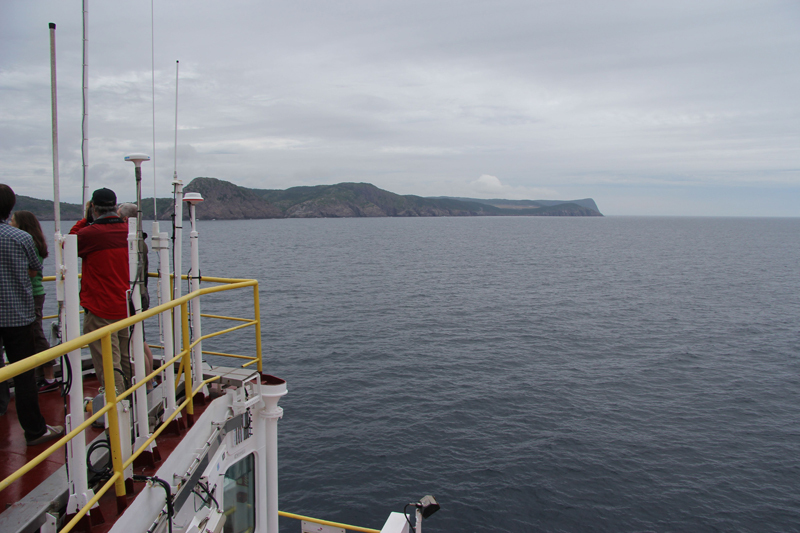 In total, the expedition recovered 5.4 km of sediment cores. Sedimentary records of these past climatic conditions have been recovered already — so what more is there to learn? The strategy for this expedition was to target piles of sediment that accumulated at relatively high rates, thus providing the ability to investigate the dynamics of events that occurred 10s of millions of years ago at similar resolution for events that occurred 100s of thousands of years ago. In about six months we’ll all gather at the Bremen, Germany core repository to take samples of these sediments that will be used for numerous analytical techniques aimed at reconstructing ocean conditions in the past. More about that, including what me and my students will be working on, in the coming months. What I loved most about being on this expedition was being part of integrated science in action. Watching the micropaleontologists and paleomagnetists — the ‘keepers of time’ as they became known among the science party — figure out where we were in Earth history was incredible. Knowing what age sediment we were drilling as accurately as possible is obviously important for the science that will be conducted for years to come, but it was also crucial for operational decisions. Should we keep drilling deeper? Do we need to drill a second, or third, hole to make sure we captured the critical intervals? These questions had to be answered in real time. It was quite exciting. With excitement comes intensity. Make no mistake, sailing on one of these expeditions is a lot of work. We worked 12-hours shifts every day for nearly 60 days. This particular expedition had very high recovery and minimal transit time between sites, which led to essentially no break in the processing of core — they just kept coming up on deck, all day, all night, the entire time. I’m still hearing the ‘core on deck’ announcement in my head. The Integrated Ocean Drilling Program is big science. The contributions from IODP and its legacy programs over the past 45 years to the understanding of how Earth works is significant. I’ve used data from this program for some of my previous research (and will for future research) and I’m thrilled to now contribute to the collection and documentation of new data that will hopefully be used to do science for decades to come. In case you missed them when they went live, here are the video episodes (each ~10 minutes long) that chronicled the expedition as we went. The sixth and final episode was shot during the final few days of the expedition and will be produced and uploaded by next week sometime. Later this fall, the film maker will produce a ~20 minute-long documentary that summarizes the entire expedition. ← IODP Exp 342: Core on the Floor! Mike, glad you enjoyed the videos. The film maker and IODP put a lot of work into them. I ended up reading ‘The Perfect Storm’ while out there, which maybe wasn’t the best way to put my mind at ease!